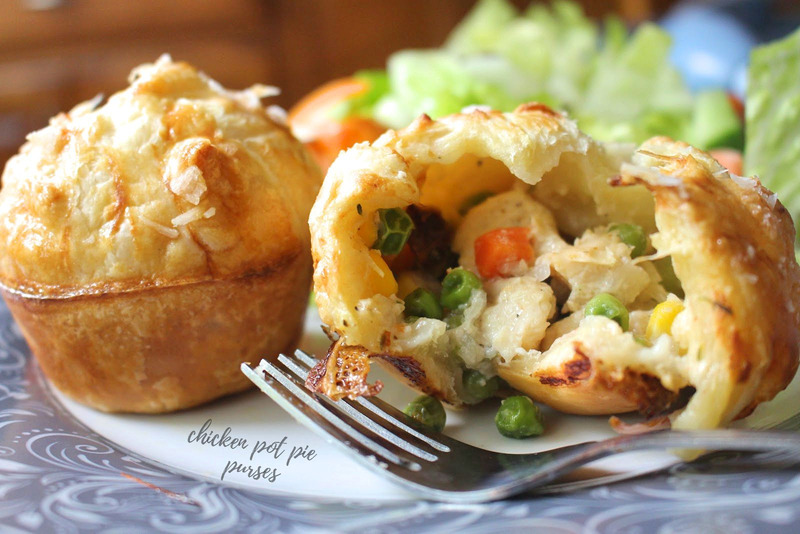 Chicken pot pie purses. Chicken pot pie is very near the top of my list for of favorite comfort foods of all time. You'd know that even without me telling you because I've posted many renditions of it on this blog, including classic, free-form, cobbler-esque, turnover-style, and even one with a barbecue twist. While it would be impossible to pick a favorite, I can't deny that puff pastry is a magical creation that somehow makes everything better, and that's what inspired these purses. I made my standard chicken pot pie filling with a tad less liquid, and then I divided it among squares of puff pastry that had been draped over a standard muffin tin hole. Pinch the edges together to form a purse and bake away! It couldn't be easier and delivers all the comfort you crave from a chicken pot pie in a cute little package. *Fill the cups higher than you think you should. Everything will shrink a little in the oven and you want a full purse of goodies at the end! *Squeeze and pinch the puff pastry together well before baking. You'll probably get some oozing anyway, but this will help keep the insides on the inside! *The egg wash is key for a nice brown crust. I like to sprinkle some finishing salt on the top, but then again, I'm obsessed with salt. *Let your filling mixture cool a bit before trying to load it into the cups--that's a good way to get a soggy bottom! *Spray your muffin tin well. Duh. Preheat the oven to 400 degrees F and spray a muffin tin with nonstick spray. Sprinkle flour over veggies and chicken, mix well, and pour the milk while stirring. Add salt and pepper and keep stirring for a couple of minutes, until liquid is thickened. Take off heat. Roll the puff pastry out to rectangles about 8x12" and cut into six 4x4" squares. Gently place the pastry squares into the muffin cups. Distribute the chicken pot pie filling evenly among the cups, then bring the edges of the dough together over the filling and press them together to seal. Whisk the egg and brush every pot pie pocket top with the egg-wash.
Bake for 27-30 minutes, until browned and bubbly. Such a clever idea and so irresistible too, Grace. You have made Chicken Pot Pie gourmet! I wonder if these would freeze well to warm for a later occasion? This is a really neat idea, I almost always have those sorts of things in my kitchen cupboards and freezer! This is another awesome recipe, Grace! Can I use fresh thyme? Looks like an easy to make chicken pot pie! And so cute, too! What a perfect dinner these would make! I love this idea. These are so cute and irresistible. What a great idea for a party, too. Thanks for reinventing a classic in such a fun way. Oh my goodness Grace, these little purses look delicious and baked to perfection, love pot pies. @Cali: Probably, though the puff pastry might lose some of its magic! You could probably freeze the cups before baking and then thaw and bake; I'll have to try that myself! Grace, you are absolutely right, chicken pot pie is high-up there on the comfort food list. You know what's really clever about these pot pie purses? You can portion control (wishful thinking for me). As always, your posts are delicious. Geat and delicious recipe. Thanks for sharing. These little pies are so cute and delicious! Perfect for a party and a buffet! Sooo cute! My husband is also a huge chicken pot pie fan. I may have to give these a try! Such a great alternative to a whole chicken pie, they look so pretty. Yum! So, you're obsessed with salt too? My husband is always asking why I need so many different kinds of salt, lol! These look so good and such a great idea. I liked your comment about filling them a little more than you think you should. That's a helpful tip. Will be trying these for sure this fall. Pot pie is one of my favorite things in all it's variations. Love reading your blog.